Personal Notes: If you saw any link broken or any strange signs in the HOA Political Scene 21 and you cannot read it in your email box, please read this edition online at HOA Political Scene 21 here. In addition, you can read the new edition of the business and love newsletter, Wise Biz, on Wednesday, June 16, 2010 at Biz Marketing 68 here. Please do not hit reply in your email box to send me messages. The Newsletter email address is not private or personal email. Instead, if you wanted to email me for the first time, send me your email address through the Contact Us page and you will get my private email. Do You Think Sudan Needs Fences with Its Neighbours? What Do Sudanese Southern Youth Want? A Break Column: Beauty of the Words! In one of his poetries, Robert Frost wrote, "Good fences make good neighbours." This verse brings my attention to Sudan. I imagined the country as a big house surrounded by other houses in the area. Probably, as you know the Sudanese house is bigger than any other house in the horn of Africa or in the entire African continent. That is one of the reasons for the real Sudanese people to be proud. You can go this way in my imagination to see the Eritrean house, the Ethiopian house, the Kenyan house, the Ugandan house, the Central African house, the Chadian house, the Libyan house and the Egyptian house. Each of those houses has fences with the other houses in the area, so the neighbours could even greet each other and chat through those fences. Imagination, friends. What has happened to the principles of neighbourhood since 1989 is very interesting. Sudan has broken the fences between its land and the neighbouring countries since 1989 when the recent military religious regime came to power through its coup with its extreme agendas to export terror to the neighbours. The regime in the Sudanese house spies on its neighbours through the fences. At the beginning of 1992 and after the independence of Eritrea, the Sudanese dictatorial regime crept into the Eritrean house to work against the Eritrean People's Liberation Front both from the western part of the new independent country and from the capital. It did the same with Ethiopia and Uganda to assist the armed groups in those countries and use them as political cards in its political game to export its agendas to those countries. The regime failed miserably when it tried to creep into Egypt, so instead of doing that, the regime preferred to shoot the Egyptian President in Ethiopia. When times go on, the regime seems retreated from its agendas and stopped its support to the juntas from many surrounding countries. However, that may only demonstrate the scene on the surface, as many opponent elements reside there in the country and find the grounds to take off to many countries in North Africa, Somalia, Saudi Arabia, the Golf area, Afghanistan and Europe too. Retrieving Robert Frost's picture, I could understand that, if you saw your neighbour naked, then chances for respect to grow between you both are rare. In addition, you may feel yourself smart by what you have and spread beyond your borders to your neighbour's properties thinking that this is just an extension to your property, since it speaks your heart. The fundamentalist regime in Sudan always thinks that the people in west Eritrea are extension to its beliefs so they can use them to destroy the political power in Asmara. Nothing is exceptional for Ethiopia according to this policy, as long as there are some Muslims in Ethiopia the false Islamic regime could use. However, the regime has not stopped at this point but it sought opponents from other beliefs to support against its neighbours. This policy makes the fences of the Sudanese house very weak and proves that the regime is not aware of its conducts. It will not stop at Darfur or at the south. Could you predict what will happen in the future? News said they want separation of the southern Sudan to establish the South Republic of Sudan. However, it seems the youth are not realistic. The separation will not stop at the independence of South Sudan. The southern Sudan is yet to accumulate the infrastructures needed for the new country to survive. The challenges in the southern Sudan are not less than the challenges in the entire Sudanese country. The independence is not the suitable option for the south at this time and at this point since the Sudanese People's Liberation Front has signed the Comprehensive Peace Agreement in 2005. It is now only 5 years since the signing of that agreement and that is not enough time for the south to decide its future. The possibilities for the south to go into many southlands are obvious. In addition, the military religious regime in the north has planned this situation and has already been paid for the separation of the south taking the ministry of energy dividing it into many ministries, taking the best of it and giving the (ash) of it to the south. 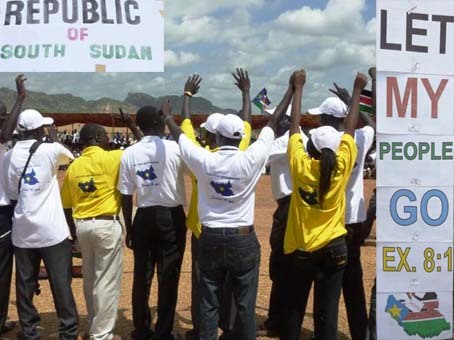 The enthusiasm of the southern Sudanese youth is good if it comes to maintain discussions on the values of justice, equality, respect, regional sharing, central power sharing and anything that could improve the unity of the entire Sudanese country. Moreover, it is likely not good to agree with international conspiracy planned by some powers to destroy those million square miles for the sake of unknown future. If they went this way to unmoor their boat, THEY WILL LOSE THE RIVER. This (as it happens column) comes to make this political newsletter more appealing and break that sticky stone in our feelings. "In the presence of her formidable beauty, I melt like the ice at the top of the Himalaya." To see the melting ice at the top of the Himalaya . . . OK, to read about it, connect to it at Ganges Delta and Indus River. You can share HOA Political Scene 21 with your services through the following buttons. Copy this address: https://www.hoa-politicalscene.com/HOA_Political_Scene-21.html, click on any button below, paste it on the filter, and choose the service you want to submit to it if you didn't see the link already embedded there.